Breast cancer is the most common malignancy in women and comprises 18% of all female cancers. One million new cases worldwide are detected every year and accounts for the most common cause of cancer death in women. The incidence of breast cancer varies between countries; the highest rates occur in the United States and Canada and the lowest rate is found in Asia. Although breast cancer is thought to be a disease of the developed world, almost 50% of breast cancer cases and 58% of deaths occur in less developed countries. Breast cancer survival rates vary greatly worldwide, ranging from 80% or over in North America, Sweden, and Japan to around 60% in middle-income countries and below 40% in low-income countries. Breast self-examination (BSE) is a simple, quick, and cost-free procedure. But the practice of BSE is low and varies in different countries. Several reasons like lack of time, lack of self-confidence in their ability to perform the technique correctly, fear of possible discovery of a lump, and embarrassment associated with manipulation of the breast have been cited as reasons for not practicing BSE. , No previous research has been done in the chosen group of the population. Hence, this study attempts to assess the level of knowledge, attitude, and practice regarding self-breast examination in a cohort of female nursing students in Puducherry. The study population consisted of all female nursing students belonging to final year from JIPMER College of Nursing, Mother Theresa Nursing College, and Vinayaka Mission Nursing College. It was a cross-sectional descriptive study to analyze the knowledge, attitude, and practice about BSE among female nursing students. Participation to the study was on a voluntary basis. All participants were assured of anonymity and confidentiality of responses. Data were collected using a self-administered pretested close-ended questionnaire. The questionnaire comprised of 21 questions (10 on knowledge, 5 on attitude and 6 on the practice). For knowledge items, categorical responses (yes, I don't know, and no) were applied with an item score of "2," "1," "0," respectively, for positive knowledge. For attitude and practice, the answers were either yes, no or options were already specified. Data were analyzed using Statistical Package for Social Sciences (SPSS) Version 20 IBM company. The study involved a cohort of 254 female nursing students, out of whom 240 completed the questionnaire. Response rate was 94.5%. The age range of the study group was 21-27 years with a mean age of 23 ± 1.56 years. The total mean knowledge score was 14.08 ± 3.42. The level of knowledge of BSE among the study population is presented in [Table 1]. Considering the response of the nursing students on BSE, their knowledge was good. All participants have heard of breast cancer, 80% answered it is common in our population. 86.7% answered that breast cancer can be detected early. 87.5% accepted that early detection can improve the chance of survival. 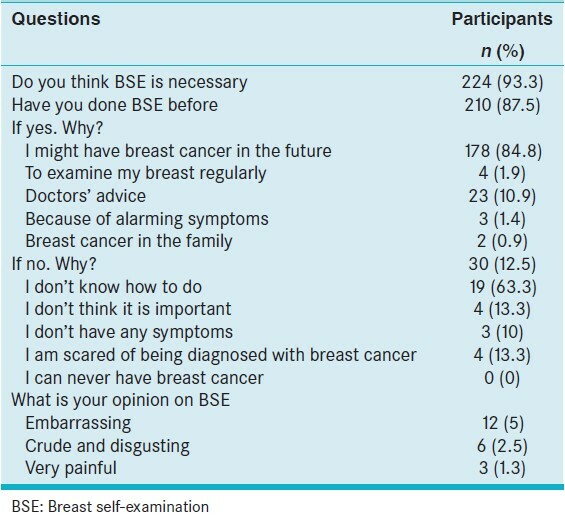 89.2% have heard of BSE and agreed that BSE can help in early detection of breast cancer. Least scoring was for questions regarding when BSE can be done, its frequency and procedure, with a mean score of 11.56 ± 1.2. Only 45.4% answered that BSE has to done on both males and females. 50.4% and 56.3% knew that BSE has to be done monthly and with palm and minimum three fingers, respectively. 47.5% answered that BSE should be done in even <19 years. Issues relating to attitude of BSE among the female nursing students are shown in [Table 2]. The results showed that 93.3% felt it was necessary to do BSE and 87.5% have done BSE before. The main reason behind doing BSE was the fear of having breast cancer in the future (84.8%). Majority of the nursing students who were not practicing BSE did not know how to do the procedure (63.3%). 13.3% also felt that it was not important to do BSE and were scared of being diagnosed of breast cancer. 5% of nursing students felt that doing BSE was embarrassing. The level of practice of BSE among the study population is presented in [Table 3]. Only 33.3% preformed BSE regularly in a year (12 times/year). 65.8% started doing BSE only after 19 years and majority (63.3%) were doing it on any day of the month. Majority of them who preformed BSE were doing it at home (73.3%). This study showed that majority of the respondents had knowledge and positive attitude toward BSE. This fact is expected considering the fact that these students would have acquired this knowledge during their training as reported by previous studies. , The overall mean knowledge score was 14.08 ± 3.42. This is similar to a study reported by Doshi et al. on female dental students were the mean knowledge score was 14.22 ± 8.04. About 89.2% of nursing students have heard of BSE. A study by Kayode et al. from Nigeria reported 95.6% awareness among female school teachers. Another study by Agboola from Nigeria reported 100% awareness among nurses. Only 53.6% knew that both male and female are required to perform BSE and 54.5% of the respondents had the view that BSE should start at <19 years in a study by Irurhe on female medical students. In our study, it was 45.4% and 47.5%, respectively. The knowledge of the nursing students who participated in our study was good when considering the questions regarding incidence of breast cancer, its early detection and general information on BSE. This is due to the knowledge they have acquired during their training. But when questioned in particular about the procedure of BSE, only approximately 50% could answer such questions. This indirectly indicates that these students have not received any specific training. Being future health professionals, these students are expected to have a good attitude toward BSE. 93.3% felt that BSE was necessary, and this is consistent with the study done by Agboola from Nigeria, which reported a result of 91%. 87.5% have done BSE earlier similar to a study which reported 91.4%. The main reason for doing BSE was fear of cancer in the future (84.4%). Earlier studies have reported 51.6%. Of those who have not done BSE, 63.3% did not know how to do. Previous studies have reported 66%  and 22.6%. Though the majority of the students felt BSE was necessary, a few still had false beliefs, fear, shyness, and embarrassment to the procedure. This attitude of the nursing students warrants addition of skills training and corrective feedback to improve the BSE proficiency. In spite of the fact that, knowledge and attitude among the study population are similar to the previous studies, percentage of those who were properly practicing BSE was less (33.3%). This shows that provision of information is sufficient to obtain BSE initiation but not necessarily adequate to maintain the practice. Other studies have also shown contrasting values: 30% in nurses,  80.2% in female medical students. Efforts should be put on increasing the practice of BSE. Prompts and reminder aids seem to contribute to long-term frequency. Evidence says that women who correctly practice BSE monthly are more likely to detect a lump in the early stage of its development, and early diagnosis has been reported to influence early treatment to yield a better survival rate. Health education and communication have been found to promote health seeking behavioral change with sufficient utilization and compliance to breast cancer prevention and screening strategies. Breast self-examination functions as an effective preventive health behavior and an important component of any program for the early detection of breast cancer. In our study, very few nursing students were correctly and regularly practicing BSE. Previous knowledge of BSE and correct health beliefs plays an important role in the promotion and utilization of BSE. Confidence in BSE performance and finding some way to remember to do BSE were the factors most positively associated with frequent BSE practice. Nursing students, being future health advisors, should be given the facts about breast cancer and information about early detection methods and also need to be taught BSE in such a way that they feel confident in their BSE skills. Seif NY, Aziz MA. Effects of breast self-examination training program on knowledge, attitude and practice of a group of working women. J Egypt Natl Cancer Inst 2000;12:105-15. World Health Organization. Breast Cancer: Prevention and Control. WHO; 2014. Available from: http://www.who.int/cancer/detection/breastcancer/en. [Last accessed on 2014 Nov 14]. Timothy JK, Pia KV, Emily B. Epidemiology of breast cancer. Lancet Oncol 2001;2:133-40. Parkin DM. Cancer in developing countries. Trends in Cancer Incidence and Mortality Cancer Surveys 1994;19-20:519-61. Karayurt O, Ozmen D, Cetinkaya AC. Awareness of breast cancer risk factors and practice of breast self examination among high school students in Turkey. BMC Public Health 2008;8:359. Ferlay J, Bray F, Parkin DM, Pisani P. Cancer Incidence, Mortality and Prevalence Worldwide. IARC Cancer Base No. 5. [1.0]. Lyon, France: IARC; 2001. Ibrahim EM, al-Idrissi HY, al-Khadra AH, Kurashi NY, al-Jishi FM, Saied I, et al. Women′s knowledge of and attitude toward breast cancer in a developing country: Implications for program interventions - Results based on interviewing 500 women in Saudi Arabia. J Cancer Educ 1991;6:73-81. Doshi D, Reddy BS, Kulkarni S, Karunakar P. Breast self-examination: Knowledge, attitude, and practice among female dental students in Hyderabad City, India. Indian J Palliat Care 2012;18:68-73. Kayode FO, Akande TM, Osagbemi GK. Knowledge, attitude and practice of breast self examination among female secondary school teachers in Ilorin, Nigeria. Eur J Sci Res 2005;10:42-7. Agboola AOJ, Deji-Agboola AM, Oritogun KS, Musa AA, Oyebadejo TY, Ayoade BA. Knowledge, attitude and practice of breast self examination in female health workers in Olabisi Onabanjo University teaching hospital, Sagamu, Nigeria. IMJ 2009;8:5-10. Irurhe NK, Olowoyeye OA, Arogundade RA, Bassey RB, Onajole AT. Knowledge, attitude and practice of breast self examination among female medical students in the university of Lagos. Internet J Health 2009;12. Petro-Nustus W, Mikhail BI. Factors associated with breast self-examination among jordanian women. Public Health Nurs 2002;19:263-71.